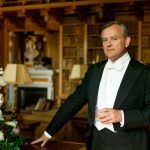 Following what seemed to be an endless string of rumors for months about a possible Downton Abbey movie, we can now get our first looks at what the Downton Abbey Nation has been waiting for since Mr. Carson shuttered the doors back in 2016. Unfortunately, as we reported recently, Matthew is still dead, and Lily James’ Lady Rose will not return. 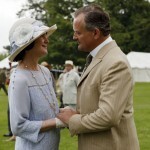 But the rest of the Downton inhabitants both upstairs and downstairs will be a part of the forthcoming feature-length film set to premiere in September 2019. “My character Rose moved off to New York, so it would be farfetched to bring her back,” James recently told People Magazine. Dame Maggie Smith, Michelle Dockery, Laura Carmichael, Joanne Froggatt, Hugh Bonneville and Elizabeth McGovern have been confirmed as reprising their roles, along with Matthew Goode, who plays Henry Talbot. Joining the cast for the film is Imelda Staunton (Harry Potter), Simon Jones (The Hitchhikers Guide to the Galaxy, Brideshead Revisited), David Haig (Killing Eve, Penny Dreadful), Tuppence Middleton (War and Peace, The Imitation Game), Kate Phillips (Peaky Blinders, The Crown) and Stephen Campbell Moore (History Boys, Lark Rise to Candleford). 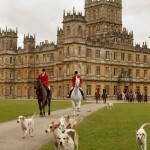 The Highclere Castle portion of filming concluded last month, with the final scene taking place in the kitchen courtyard. 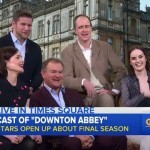 NBC gets an exclusive behind-the-scenes look at the classic set as NBC’s Keir Simmons talks to Hugh Bonneville, Joanne Froggatt and others, and tours the grounds for TODAY. 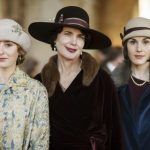 Downton Abbey: The Movie hits UK and American cinema in September 2019.